The concern related to weakening women leadership pipeline in the industry is a topic of serious discussion today. Numbers support the fact that there are more women joining corporate life but there are very few who reach to the top positions. One of the reasons attributed to this situation is Career Break by Indian women. It is argued that Indian social structure and expectations impel women to take a career break to attend to family or other responsibilities. Many times this happens when women are in mid-management roles in their corporate career. Although there is more receptivity in corporations regarding women returning to work after the career break, still returning to corporate becomes difficult due to corporate policies and changing business environment. Many times, return becomes difficult due to apprehensions regarding contemporary knowledge or due to apprehension regarding the priority of women. At this juncture, women need to re-skill and prepare for their return. 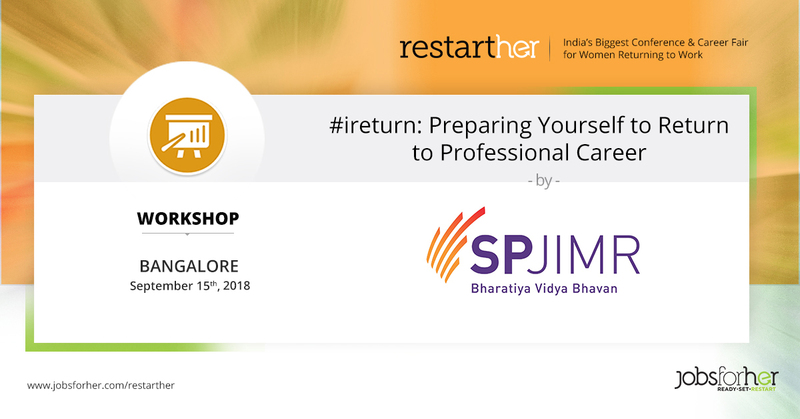 The workshop highlights the four critical things needed to return successfully to the corporate leadership pipeline and how women can neutralize the effect of the break on the professional career. We will have a woman (an alumnus of our program) sharing her personal journey of successfully returning to the professional career. The session would conclude with a Q&A session. 25 minutes: 4 things you need to bounce back. How to prepare?